Recently, I joined a Royal Forestry Society "day out" which included a visit to a business which is doing something quite unusual and of great benefit to woodland owners, especially those with chestnut coppice. The Woodland Centre at Whitesmith near Lewes in East Sussex is home to a factory that makes use of small diameter timber sourced locally from deciduous trees (mainly chestnut). The owner of the business, In-wood Developments Ltd, was set up in 1999 and is run by Nigel Braden and Edward Stenhouse. They use mainly chestnut coppice of between 25 and 40 years old, but they can also process larch and oak. 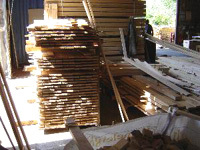 In-wood buys and collects the timber direct from growers, transports it back to their factory and mill it into strips. These strips are then seasoned ("air dried") and processing in their main workshop can begin. Here they cut out the knots and then cut finger-joints, apply a very strong polyurethane glue from Switzerland and finally clamp it together while the glue dries. The result is impressive long lengths (up to 18 metres) of strong, knot-free chestnut that can be used in building construction. Typical uses are cladding and decking but it can also be used for furniture or structural work. It has, for example, been used by David Saunders for his building at Flimwell. Historically, people have been put off using timber from deciduous woodland because of the difficulty of getting timber that is large enough and of a good enough quality. Both these problems are addressed with In-wood's process: the finger-jointing enables longer sections to be produced and, because it doesn't matter how many small pieces are joined together, all the knots can be cut out to improve strength and durability. Chestnut over about 40 years old is avoided as it too often contains shake (splits in the trunk), making it unusable. This is really a pioneering enterprise: Nigel and Edward have shown that automated finger-jointing technology and high-strength durable glues have revolutionised the possibilities for using otherwise low-value, but local timber in exciting ways. The techniques employed at In-wood substantially improve the economics of growing small-diameter chestnut. The production of this knot-free local chestnut can potentially reduce the impact on the environment from the importing of wood from overseas, and encourage the practice, due to increasing the economic viability, of growing chestnut coppice. Growing chestnut coppice is not only a very old tradition in the South East of England going back to Roman times but it is also completely sustainable. Tours of In-wood's factory can be organised through the company and I'd definitely recommend going on one: their website is at www.in-wood.co.uk. I am looking to sell some old rustic chestnut planking 8″ and beams 10″.